Eating out in Singapore is getting considerably expensive. Nowadays, it is increasingly difficult to find a restaurant that serves good food at reasonable prices. When I was at The Clan Restaurant for dinner, I was surprised to find out that it not only dishes out an extensive menu – with offerings of cold dish, side dish, soup, main course and dessert – that you really cannot go wrong with, but it is also relatively inexpensive given the quality of the food. Under the cold dish category, our party tasted most of the dishes, and everyone agreed that the Beef Carpaccio ($20) was a terrific choice. The pairing of well-marbled beef slices and truffle mustard salad with truffle teriyaki & horseradish sauce made for a winning combination. The other favourite of the table was Alaskan King Crab ($22). It stood out with its light homemade Karashi dressing that allowed the freshness of the crab to shine through. The Chef’s Starter ($18) – a trio of foie gras chawanmushi, seared scallops with truffle foam, and hamachi with ponzu – is also a good way to start the meal. After sampling the cold dishes, we progressed to side dishes of Deep Fried Foie Gras ($18) with balsamic reduction and cheese focaccia, Kurobuta Pork Belly Confit ($15) with pork cracker and passion fruit sauce and Steamed Razar Clam ($15) drizzled with Japanese sauce, and Herb Crusted Mushroom Escargot ($15). Among them, the standout dish was the Kurobuta Pork Belly Confit, while the Foie Gras was disappointing as the deep-fried batter overwhelmed the foie gras. The Clan has main courses like Spiced Braised Lamb Shank ($29), 48 Degree Poached Salmon with Japanese broth ($27) and Pan Seared Cod Fish ($29). But what you must order is the 48 Hours Beef Short Ribs served on hoba leaf and lava stone. Everyone was gushing when the waiter served the dish to the table. It was outstanding, and undoubtedly the highlight of our dinner. 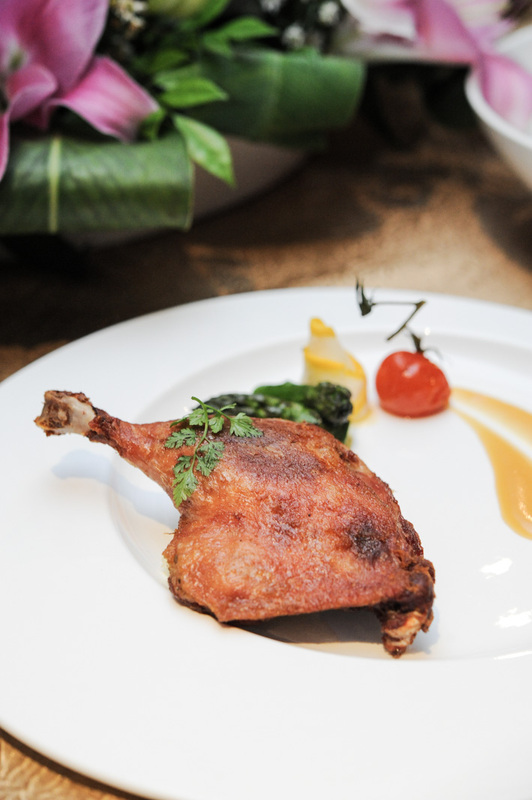 Another commendable dish from the menu is the Duck Confit ($26) with plum mustard, and truffle mashed potato. Sweet treats include a Madeira Cheese Panna Cotta ($10), Chocolate Lava ($10) with homemade gelato, Triple Espresso Crème Brulee ($10) and the excellent and highly recommended Chan La Royaltine Chocolate Cake ($11). I tried their valentines day menu! super good! i love the Clan! Went there for my anniversary. Agree that it is good value for money. Loved the Wagyu beef on hotstone! The dishes were exquisite! Bravo!